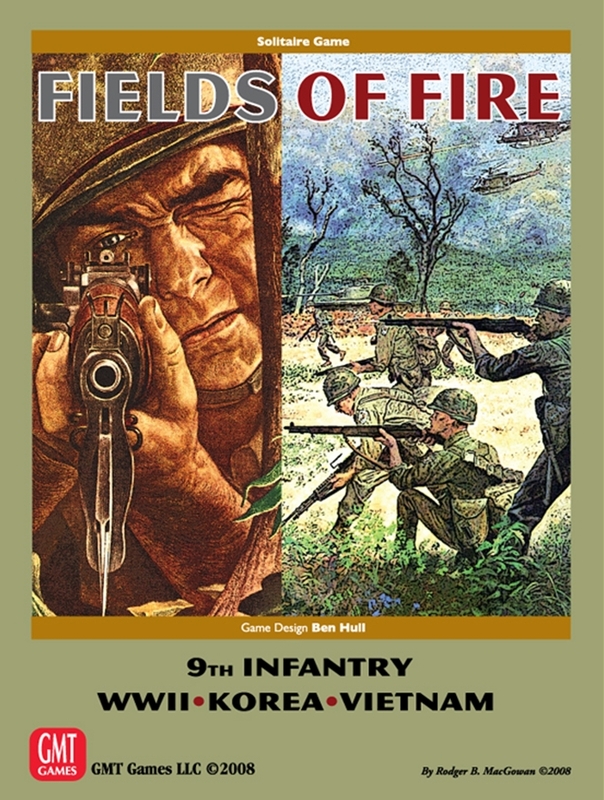 Fields of Fire, designed by Ben Hull and published by GMT games is the best solitaire wargame and I think it could challenge any non-solitaire wargame for quality, immersion, fun, and challenge. I first discovered this game in the long dark days between the first edition and the newly printed second edition. There aren't many in my regular game group who entertain my wargame habit. In researching my drug of choice, I quickly discovered Ambush as a solo wargame. I promptly paid a benevolent stranger on eBay a princely sum and on completing the first scenario I was hooked. I went on to play the game out and wanting more. I had never played a game that told such a great story and in which you were so emotionally invested in the characters. However in Ambush, each mission is exactly the same, obviously, the outcome will be different, but all the events are preprogrammed to happen again. Ambush has little replayability value but it's a blast the first time around. For my next fix, I found Fields of Fire; it came with a recommendation, 'if you like Ambush, you'll like this', and a warning 'you could go insane trying to understand the rules'. Unfortunately for me, the game was out of print and out of stock everywhere I looked. So I fired up Vassal and printed off the rules and got ready for an education. As soon as I started scratching at the system I realised that there was something special here, and the myriad of player aids and unofficial rules available at the game page on board game geek made me think that I wasn't the only one who saw something great. I learnt the game over a week or so using some terrific examples of play and introductions that others had written, which for me, were invaluable for learning the game. Fields of Fire puts you in the shoes of a 2nd Lieutenant in command of a rifle company of the US Armies 9th Infantry Regiment. This regiment, the 'Manchus' are one of the oldest and most decorated infantry regiments in the US Army. The game portrays their experience through WWII, Korea and Vietnam. There are not many war games that provide 3 different conflicts as part of the base game. Instead of the traditional wargame hex map, you get a deck of terrain cards which are constructed, per the scenario setup, in front of you in order for you to analyse the terrain before you plan your strategy. There are different terrain decks for each theatre: WWII, Korea and Vietnam and each terrain area has specific attributes, like cover, combat modifier, trafficability, and burst effect. You need to plan to use the strengths and weaknesses of each card as your troops move up the 'map' to take their objectives. After you've decided on your plan of attack you then form up your troops in the staging area just off-map and start worrying about what's out there on the map and whether you're going to survive. The way in which each scenario plays out is largely driven by an Action Deck of cards, which contain a plethora of numbers which determine the results of your orders, your attacks, your skirmish results indeed any type of randomisation in the game is resolved by drawing an Action Card. I read one online commenter who claimed their Action Deck cheats. I empathise with them. The entropy caused by the Action Deck and the Terrain Deck changes the scenario so much that in playing through the same scenario twice, it feels completely different. But in none of them will it be easy, in fact in my experience it is often a brutal and savage experience in which you find yourself clinging onto your last vestiges of command whilst you vainly try to establish contact with your subordinate HQs. What this does is give this game, with 29 included scenarios, almost infinite re-playability. 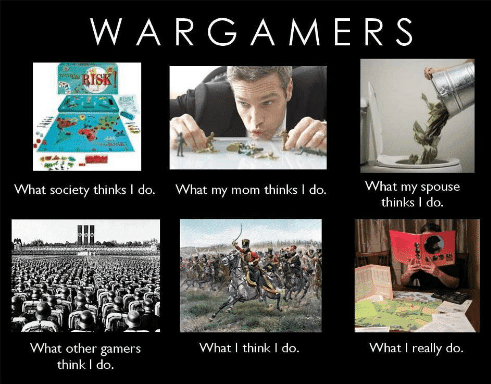 There are some gamers that decry any randomisation and abhor dice, not something the typical wargamer shuns. However, there are no dice here. You do have the equivalent of a d12 on each Action card. With nearly every order, you're drawing another Action card. This means you're going to reshuffle that Action Deck a lot. They're typical inflexible GMT card stock, i.e. they don't lend themselves to easy shuffling but I've sleeved mine and it is a breeze to shuffle. I am not a 'sleever' per se; my Terrain Decks will not be protected, but the Action Deck will receive such heavy use I would recommend sleeving for protection and to aid shuffling. Normandy Mission #1 set-up. Note the hills/stacked cards these will prove very useful in maintaining LOS and therefore comms with your subordinates. One requirement of playing solo is integrity, it's easy to cheat when playing alone. But in this game, there are so many edge cases that crop up sometimes a referral to the rulebook in every single instance costs too much time. Given enough experience, (probably 3+ games) you know 90% of the game with just the Sequence of Play to jog your memory. I would recommend in those edge cases to just play through what you think is sensible and find the rule after the game, if still necessary. In order for your units to make an action, they need to be given orders from a higher HQ, as determined by the Action Deck which is then modified by game conditions. Your CO HQ can then 'spend' them on any subordinate unit. This command hierarchy exists above and below your CO HQ and is a crucial part of this game e.g. your 1st Plt HQ cannot order a 2nd Plt unit, similarly, your 1st Plt HQ cannot order CO Staff. Where you attach machine guns, mortars and vehicle assets and how they may be commanded and from which terrain, should all be considered in the planning phase to increase your chance of success. 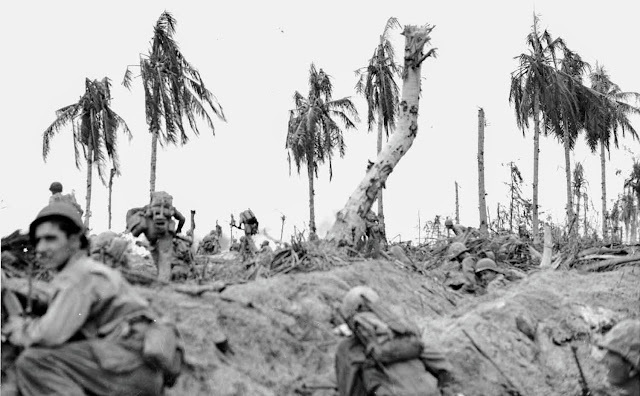 On some turns, you may find your CO HQ with very few commands and they are unable to order any of their subordinates because they are out of communication i.e. the subordinate cannot see or hear their commander giving them an order. If not in visual/verbal communication then they are left to their own initiative. However, if they see an enemy your units will never have to be ordered to open fire, that is automatic. Strangely for a tactical war game, you'll find yourself ordering 'ceasefire' more often than not in an effort to conserve ammunition. The game system also allows for pyrotechnics to be used to signal your on-map units. Upon seeing a flare they will attempt to carry out the action that was assigned to that flare during the planning phase. Although a new player may be overwhelmed by the multitude of different options, I found my gameplay took an exponential leap forward when I learnt to use pyros proficiently. When talking about a tactical squad level infantry combat game, I can't think of anything that is missing from this game. You have forward observers that can call in fire support, jeeps, tanks, helicopters, communications, ammo depletion. If I had to criticise the game, and I really don't want to, then maybe the vehicle segments are a little abstracted. However, that is probably a design choice because this isn't Panzer Leader or Check Your 6! whose focus is on armour and airborne battles respectively. This game's focus is firmly on the infantry battle, deep down at the tactical and company level and in that it excels. This tactical realism comes with a price. You have to manage the Volume of Fire and Primary Direction of Fire counters and all the other ancillary chits which are placed and removed each turn. There is a fair bit of counter management and sometimes, 3 hours into a tough scenario you cannot see the chits from the cards, figuratively speaking. I have found myself just staring at the map, and I'd like to say I was deciding what to do next to save my sorry situation, but the reality was I was just drained, not thinking, just staring. You could say this game had caused some cardboard-induced PTSD and I was diagnosed with the burden of command. I find this game contains the most realistic version of the known unknowns and inherent fallibility of an infantry-man in hostile territory than any other game I know. Whilst playing this game I am nervous and yet hopeful. I have never commanded an infantry company and I hope my next comment does nothing to diminish the sacrifice or demean the jobs of those that have served in such positions, but this game is the closest a wargamer could get to the reality of 20th-century combat, albeit with the obvious exclusion of physical harm. This game really does feel like a fight; against the enemy, of survival and against the system which is doing its utmost to win. The second edition has got some excellent player aids. For some strange reason, whether through design or just the rose-tinted glasses through which I view this game, I always seemed to pick up the right chart. There is also another game in the works using the same system. Fields of Fire Vol 2. With the Old Breed which introduces the 5th Marines in WWII via Peleliu, Korea and Vietnam. It's currently on GMT's P500, which will be the cheapest price you could ever buy it for. 'Vol 2', As I understand it, is a complete game in its own right and you do not need to own Vol 1. I didn't ever suffer use the first edition of the rules, so can't attest to their readability or clarity, which are notorious in bgg forums. I started with the unofficial rulebooks the gaming community had collaboratively put together which I thought were good to learn from and to refer to. The second edition's rules borrow a lot from those efforts and what we now have is an excellent rule book, although the game itself is quite complex I can't criticise the new rulebook. It has clarified several aspects which I found very useful. Overall, the second edition is a glorious production with top quality components and worth every bit of its $75 price tag. Every wargamer who is inclined to play solo, either occasionally or predominantly and who can invest a bit of time would do well to pick this up. If you're willing to put a little bit of effort in, you won't be disappointed. The stories that are created on your table-top are more visceral and as close to what I imagine real infantry combat to be like than any other game I know. If I had to choose one game to play for the rest of my life i.e. my 'desert-island game', it would be this one. I've been playing it for approximately 3 years and I still find it fresh and challenging and even now, I am looking forward to my next patrol. Thanks, very interesting. What would you strip out of the game to make it simpler? I.e. what seems to have little overall effect compared to the player's involvement? The card terrain system seems a little arbitrary. Thanks for the comment Nick. The deck of terrain cards are what make this game so good! You're right in that the map is abstracted somewhat in this game (if I have paraphrased your comment correctly) but I think they are integral to the system. The terrain cards are the map and where the skirmishes play out. If I had to leave out one thing it would be tracking ammo. We could just assume that in these skirmishes your mortars and HMGs have enough ammo. They've tried to streamline that process in the 2nd edition with rotating and numbered ammo counters, which help, but it's still a bit fiddly compared to the gameplay benefit that is derived from tracking ammo. Another option would be to leave out, casualty evacuations. Although you're not really adding too much complexity be leaving that in. I would keep everything else. Have you played this game Nick? I haven't, but you're making me want to get it!